(18/P008) TRENTON – The Department of Environmental Protection’s Division of Coastal Engineering has launched a major project utilizing sand dredged to create a safe boat channel for Little Egg Inlet to repair beaches and dunes on southern Long Beach Island that have sustained significant erosion from storms. Oak Brook, Ill.-based Great Lakes Dock and Dredge Co. on Jan. 18 launched the $18.4 million project that is utilizing sand from the southern portion of the inlet to repair beaches and dunes in Holgate and Beach Haven. The inlet is a major thoroughfare for recreational and commercial fishing boats between southern Long Beach Island and Brigantine. The project is funded by the DEP’s Shore Protection program. The DEP is also partnering with the U.S. Army Corps of Engineers and Brigantine to pump 755,000 cubic yards of sand from the much smaller Brigantine Inlet, south of Little Egg Inlet, to repair beaches and dunes in that city that were damaged by a nor’easter in January 2016. The project began Jan. 19. 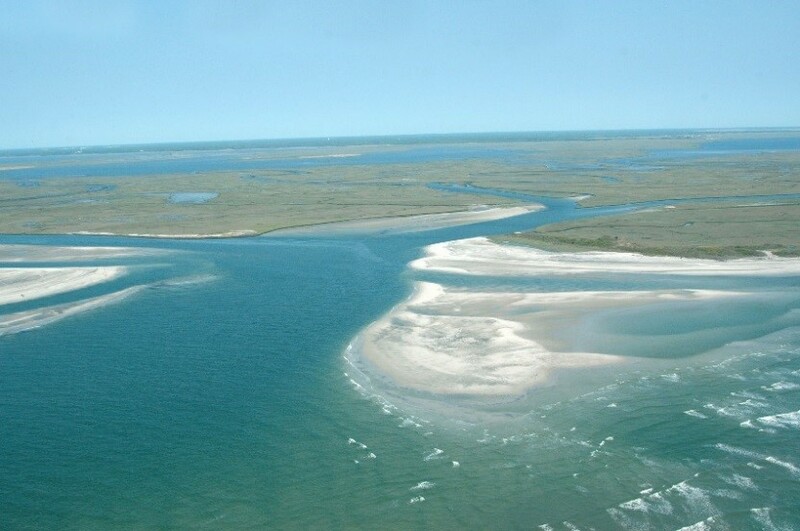 Brigantine Inlet is not a navigation channel but has accumulated large shoals that can be utilized as a “borrow” area to provide sand for beaches and dunes. Cranford-based Weeks Marine is implementing this $10.6 million project for the Army Corps of Engineers, which is providing $9.8 million in funding. The project will repair beaches and dunes from north of 14th Street south to Roosevelt Avenue. The DEP and city are cost-sharing the balance. The much larger Little Egg Inlet is one of the widest inlets in New Jersey, and is extremely dynamic with shoals constantly shifting with the seasons. It provides access to the Little Egg Harbor portion of Barnegat Bay and Great Bay. The channel has never been dredged. Over the years, the Coast Guard would mark the safest natural channel through the inlet. In March 2017, the Coast Guard removed navigational buoys because shoaling was so severe that no safe channel could be marked. 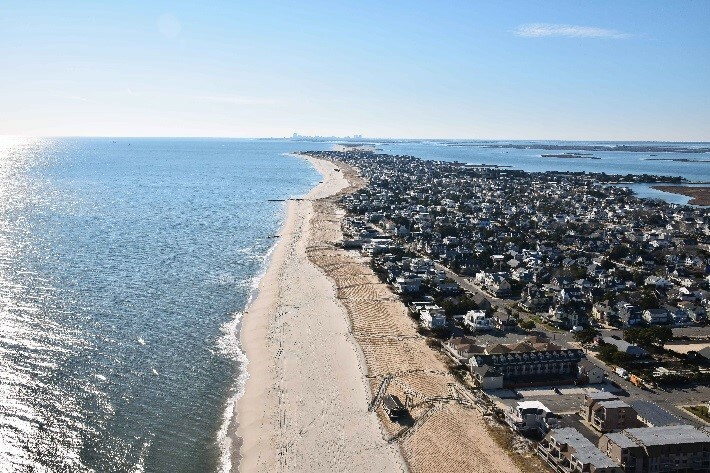 The Little Egg Inlet project will clear a mile-long portion of the previously marked channel that is 24 feet below mean sea level, using this sand to restore beaches in Beach Haven and Holgate on Long Beach Island. The Dredge Texas is working in conjunction with two large booster pumps to pump sand onto beaches. Sand replacement work began near Susan Avenue in Holgate and is working north toward Beach Haven. Work has progressed to the area near Jeffries Avenue in Beach Haven. Work in Beach Haven will take about two more weeks, depending on weather. Upon completion of work in Beach Haven, the dredge will begin operations near Rosemma Avenue in the Holgate section of Long Beach Township and will work southward to the Forsythe National Wildlife Refuge border. Pumping in this section should take about three weeks. Depending on weather, the expectation is that all work and demobilization will be completed by mid-March. In total, some 700,000 cubic yards of sand will be moved from the inlet to the beaches, with an option to move an additional 300,000 cubic yards if necessary. Each of the municipalities will be re-establishing sand fences, crossovers, and dune grass once the contract work and demobilization is completed.